Recommendation: This unique, richly illustrated volume deserves a place on the shelf of all Middle East scholars and enthusiasts. Belligerent Iran remains a touchstone of Middle East conflict and tension. And the spearhead of its military might remains the Islamic Republic of Iran Air Force – the IRIAF. That’s the subject of a fascinating study from Harpia Publishing. 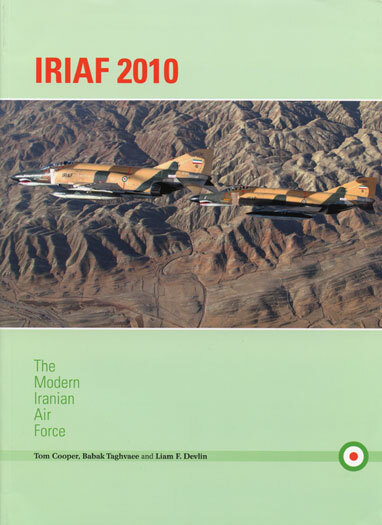 And IRIAF 2010: The Modern Iranian Air Force certainly offers a spellbinding snapshot of Iranian military aviation today. Authors Tom Cooper, Babak Taghvaee and Liam F. Devlin paint an absorbing, 160-page picture of survival amidst conflict with internal and external foes. Opening chapters outline the air arm’s rich historical heritage. And 12 subsequent sections provide a surprisingly candid, base-by-base précis of current IRIAF combat and support capabilities. Modelers note! Over 120 beautiful color shots season the account. Every major IRIAF aircraft type – fighters, transports, trainers and helicopters – populate the pages. And the order-of-battle summary even includes rare unit badges! This unique, richly illustrated volume deserves a place on the shelf of all Middle East scholars and enthusiasts.